Sports activities play a major role in Dubai these days. Especially with Dubai Sports City, it could even be responsible for hosting the Olympic Games one day. With Dubai’s supreme horse-racing tracks, golf courses and its long awaited Formula 1 autodrome, it is surely a sportsman’s paradise city. 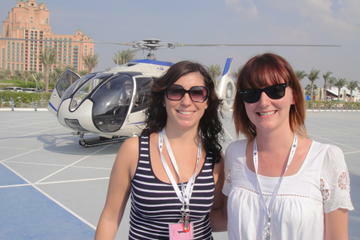 There are plenty of activities, Dubai tours to get involved in. Whether you want to sit back and enjoy watching your favourite sport, or wish to participate in a thrilling activity for those exciting adrenaline rushes, Dubai has the answer! 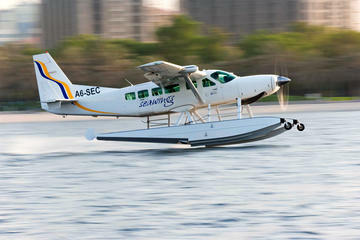 Experience the wonders of an aerial view on the 40-minute Dubai Seaplane Flight. You have the option of selecting from three departure times from the take-off locations of Jebel Ali or Dubai Creek. The modern Cessna seaplane ascends and takes you around Burj Khalifa, the world’s tallest building, and the Palm Jumeirah, Port Rashid, Dubai Marina and more. Indulge in some aerial photography as you swoop over the city’s top attractions. Admire the sights of Dubai on both land and in air on this half-day Dubai combo tour! Fly through the skies of Dubai on a 15-minute helicopter flight, and take in aerial views of the city's ultramodern architectural jewels including Burj Khalifa and more. On land, explore the city by coach with a guide. Tour some of the famous landmarks such as man-made archipelago of Palm Jumeirah, Atlantis and Burj Al-Arab hotels, finally finishing off the tour with visits to Jumeirah Mosque and Dubai Museum in Al-Fahidi Fort. This 45-minute seaplane flight from Dubai to Abu Dhabi * takes you to the skies, flying above desert landscapes and architectural marvels such as Palm Jumeirah, Burj Khalifa and World Islands in Dubai to the Yas Viceroy, Emirates Palace and F1 Grand Prix Circuit in Abu Dhabi. 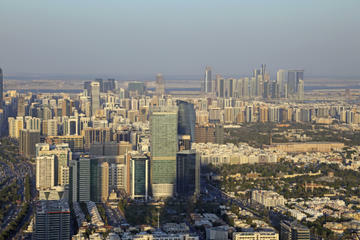 The tour includes transport and entry to Ferrari World – the world’s largest theme park! 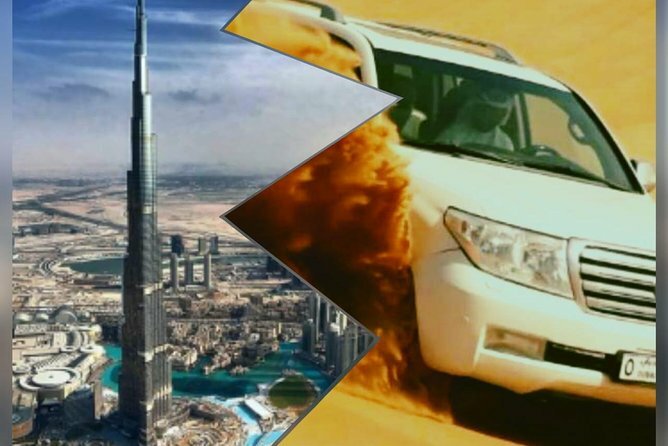 A pure adrenaline racing experience for thrill seekers, this exciting desert encounter tour from Dubai ventures into the Arabian Desert in a comfortable 4x4 that’s driven by an expert guide. 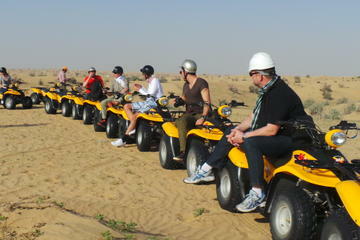 Enjoy a rugged quad bike tour and feel the excitement of sandboarding down the silky dunes. 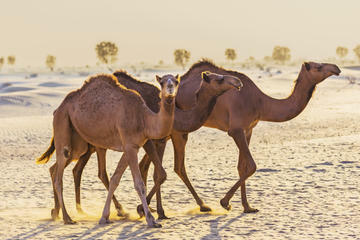 Visit a traditional camel farm to capture snapshots of the desert animals as well as get to ride a camel Bedouin style. Certainly one of the main attractions of your Dubai vacation, a dinner cruise is the most ideal way to enjoy the charming panoramas of Deira and Bur Dubai in a relaxing and welcoming ambience. 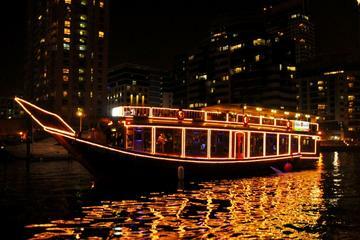 This 2-Hour Dhow Dinner Cruise aboard a traditional Arabian ‘dhow’ with a lavish buffet of delicious Emirati and international dishes is an experience that's unmatched. A truly unmatched adrenaline rush is waiting to be experienced on this thrilling 3-hour desert ride through the sun-drenched plains that surround Dubai! 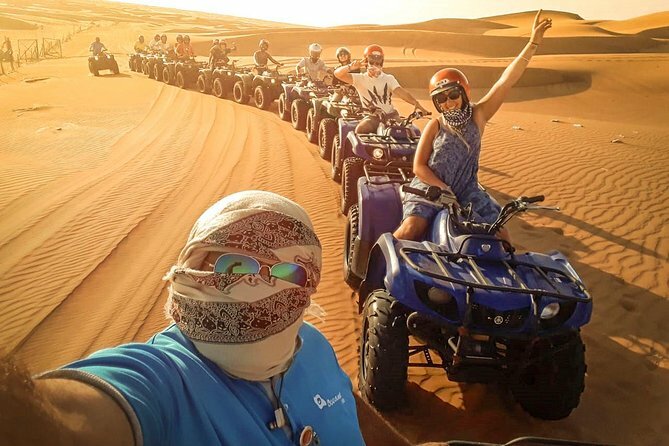 Have your choice of a Sand buggy or Quad bike tour and listen to a safety briefing before following a local guide around the desert’s canyons and valleys. The enthralling experience includes use of a helmet and goggles, plus a soft drink break halfway through the ride when you can take photos. 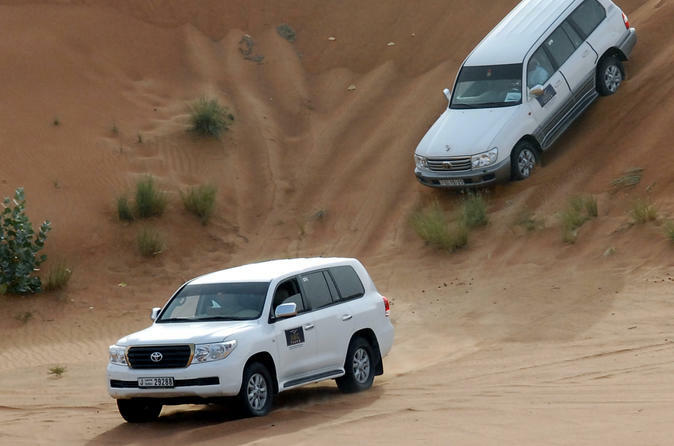 Experience the gilded deserts on the most popular desert safari in Dubai, the 4x4 Dubai Desert Safari for a generous 6-hours. Travel with your guide in a 4x4 vehicle, and visit a conventional camel farm. Feel the environs as you ride a camel and enjoy surfing on a sandboard. With the mesmerising sunset, relax at the campsite and get tattooed by henna-artists and watch the Tanoura folk dance. A perfect tour under with stars and complete with scrumptious BBQ dinner. Head into the Lehbab Desert and ride across the dunes on a quad bike. Continue to a desert camp for a delicious BBQ and traditional entertainment. Begin this 6-hour program with a comfortable air-conditioned drive into the Lehbab Desert. Receive instructions at the quad bike center, put on your protective gear and hop on a quad bike. Set off for a dune ride across the red sands for about 45 minutes. Add to the adventure afterwards by trying your hand at sandboarding. Continue to a typical desert camp and experience various activities such as henna tattooing, shisha pipe smoking and dressing up in Arabian attire. Go for a short ride on a camel. Enjoy a tasty barbecue Lunch / dinner buffet accompanied by live traditional tanoura and belly dancing shows, before heading back to the city. 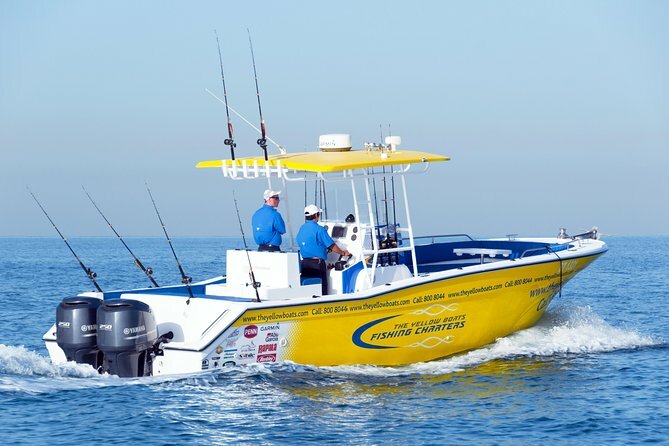 Exceptional fishing experience for anglers who crave deep sea fishing adventure while enjoying the most spectacular sights around the waters of the Arabian Gulf. All gear included. Just bring your hat, sunglasses, sun cream, and have your camera ready. Embark on a thrilling desert adventure on this 7-hour 4-wheel-drive safari that includes buffet dinner and Middle Eastern show. Roar across sand dunes, visit an oasis and a camel farm, ride a camel, go sandboarding, henna your hands, brave a shisha pipe, and pose for photos in Arabic dress. Feast on a barbecue buffet, admire a desert sunset, and watch a belly dancer and whirling dervish. 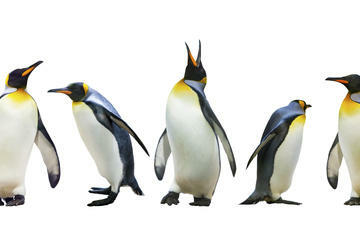 Meet the Gentoo and King penguins at Ski Dubai during this 40-minute penguin encounter. This tour gives you the chance to enjoy a personal interaction with two or more of the wonderful birds as the photographer snaps photos of your encounter. See the penguins by the pool and watch them perform amusing underwater antics at the underwater viewing area.